Chelsea Morris is excited for her final summer before going to college. She has big dreams of working in fashion design, and part of making that dream come true is working as the lead costume designer for a local theater group while working a part-time job and babysitting her younger brothers. Chelsea’s dream summer includes spending time with her boyfriend, Todd, but with his schedule filling up with work and Chelsea becoming more involved in the theater, the summer isn’t going quite as planned. Then, there’s the good-looking actor, Dylan, who’s paying extra attention to Chelsea. Though Todd dislikes the friendship, Chelsea finds herself drawn to Dylan and his free-spirited personality. As Chelsea and Todd grow further apart, and Chelsea shirks her costume design duties to sneak out for parties at Dylan’s, she begins to wonder where God is in her life and how to get back to where she belongs before it’s too late. Chelsea’s story is written in clear, accessible language. It’s a story many can relate with–wondering if the heart is leading in the right direction and how to discern truth from lies. Chelsea is a great character with unique interests. She has passions, goals, and she’s willing to work hard to achieve them. Through her experiences, the reader learns a lot about real friendship with positive examples of Christian girls confiding in one another and encouraging each other in their faith. The author, Amy Clipston, deals with some real issues for Christian teens, including teen drinking. The situations that Chelsea puts herself in are realistic–how should young Christians handle teen drinking and partying? Why is it so difficult to stand up to peer pressure? Clipston doesn’t shy away from this issue, and her characters make decisions that are ultimately a positive example for young readers. It took me a while to connect emotionally with Chelsea. While I knew plenty about her–she’s dependable, hard-working, driven, loves fashion and costume design–I didn’t really connect with her until she started struggling with her relationships. At times, I had a hard time understanding her reactions. While most of the story was relatable and believable, there were moments when Chelsea overreacted or made decisions that seemed out of character, especially when it came to the partying scenes. This is a great read for young adult and new adult readers. 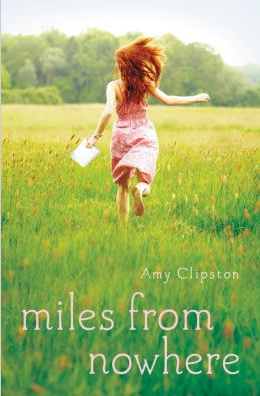 Clipston tells a wonderful story of young love, responsibility, friendship, and faith in the midst of peer pressure. While the story is fairly predictable, readers will be able to relate to Chelsea’s story and will enjoy the insight into the theater scene. You can order a copy at Zondervan or check out a copy at your local library! Clipston, Amy. Miles from Nowhere. Grand Rapids, MI: Zondervan, 2015. Print.